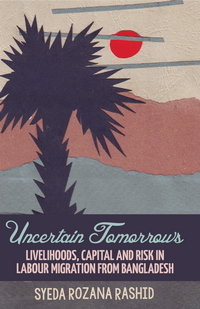 This ethnography seeks to understand the connections between livelihoods, risk, capital and migration by using a framework which considers not only economic implications but more importantly, the social and cultural underpinnings of the phenomena under study. Drawing on the lived experiences, ideas, beliefs and attitude of men and women from two migration-intensive villages in Comilla, Bangladesh, the study attempts to explore the causal links between lack of security in people’s lives and livelihoods and overseas labour migration. The book contributes to the migration literature by suggesting that while migration, as a livelihood diversification strategy, helps people to improve their capacity and flexibility to fight against the risk of low-earning, it may also generates new risk of failure and consequent losses of economic and social capital — a factor which forces migrants to invest migration-money in building informal safety nets. The study draws an analogy between the uncertain state of migrants and that of Bangladesh in the international labour market and stresses the need for a well-formulated and carefully implemented formal protection mechanism so that migration can be a route to self-sustaining progress for low- income people. The book will thus not only provide much food for thought for those interested in exploring geographical, social and economic mobility, but also for those interested in ensuring better deals for the migrants through policy changes. Although a wider view is beyond the scope of this single ethnography, I hope that my work can be used by students, academics, researchers and others who wish to construct wide generalizing frames.